The standing rigging is a mixture of Dyneema and PBO - All replaced in 2016. Dazcats Multihuls have been repeatedly proven both as racers and cruisers and they have competed in numerous international racing events, achieving class and overall wins in the Fastnet, Transatlantic, Round Britain and Ireland races, as well as many others. They have cruised the world in comfort and safety, and are built to be light and strong, taking you wherever you want to go in a unique and personalised synergy of style and function. This Cat was built by DAZCAT as an out-and-out blue water racing boat. Although she is currently used for cruising she has retained many of the state of the art features such as carbon fire spars and Dyneema rigging although the water ballast system has now need de-comissioned. Although built as a racing craft she has sizeable accommodation in her two hulls which include 2 double berths as well as two additional single berths. There are two heads compartments at the foward end of both hulls and cabin off the cockpit for shelter during the day. All the accommodation is functional although she would benefit from some cosmetic works to the interion. 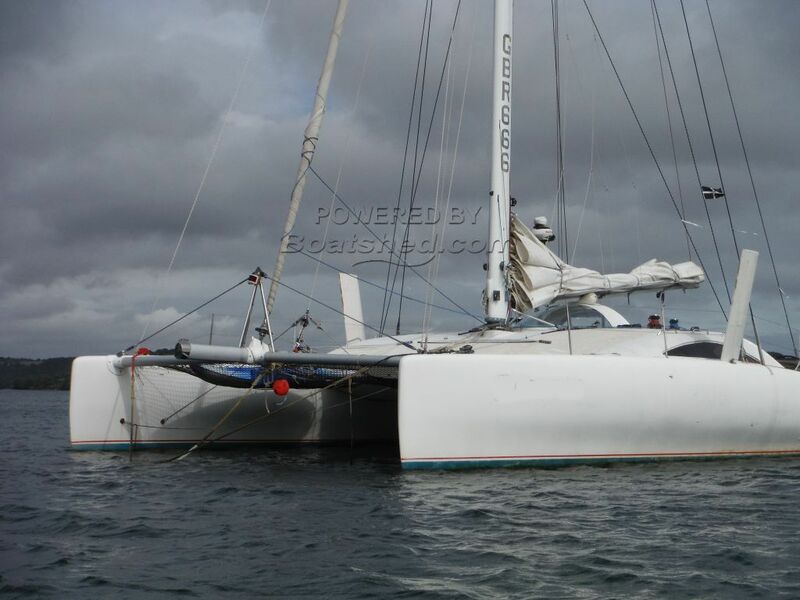 So if you are looking for a fast blue water cruising cat this should be on your list to view. This Dazcat 12 Metre has been personally photographed and viewed by Chris of Boatshed Falmouth. Click here for contact details.